Dogs come in different sizes and characteristics. While there are some that are cuddly and sweet, others are tough and strong. This is why there are dog toys for aggressive chewers to help them keep preoccupied. These dogs normally need a tough dog toy that they can play around with. Otherwise, your dog may end up getting bored and will tear through your home. When you’re picking out a toy for your dog, you have to make sure that it suits his behavior. This is because when you give an aggressive dog the wrong type of toy, it will likely get torn apart in less than an hour. Apart from costing you money, it can also put your dog at risk for harming himself. This is why it is important for you, as a dog owner, to purchase the right chew toys for aggressive chewers. In doing so, you can keep your dog safe and not end up buying so many dog toys that will get ruined so quickly. Rubber – Most of the best toys for aggressive chewers are made from rubber. This is because this is a durable and almost indestructible material safe for dogs. If you are buying a dog toy, this should be your first choice. Remember to look for a rubber dog toy that have soft, malleable edges. These dog toys are also great for puppies who are teething. Thick Rope Material – Another material that makes a great choice as a dog toy for aggressive chewers is thick rope. This material comes as a durable and safe option for dog toys. At the same time, it is easy to clean since you just have to throw it in the wash. This dog toy also makes as a great way to bond with your dog since you can play tug-of-war with him. One thing you have to remember though is that no material is truly indestructible. The dog toy will eventually get ruined, depending on how often your dog gnaws on the toy. 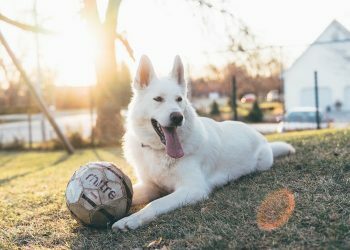 But by picking out the right material for the dog toy, you can be sure that you are choosing something that is durable enough to withstand the pressure. In addition to the material, you should also remember to look for a toy with the right size for your dog. If you pick out a dog toy that’s too small for your aggressive chewer, it could end up causing your dog to choke. This is particularly true if you end up buying a small toy for your large dog. Your dog could end up choking on the toy and causing him danger. This is why you need to make sure you pick out a toy is too large for your dog to swallow. A larger toy will also be more durable for your dog’s teeth and jaw. 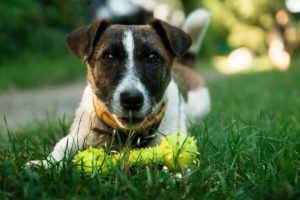 After knowing the type of material and size used on the best chew toys for aggressive chewers, it is also important to know which dog toys you should avoid. This is because not every single dog toy will be safe and compatible with your dog. To add, there are some chew toys that are made of poor quality that they break apart so easily. When that happens, they could pose a choking hazard on your dog and it could be detrimental for his health. Latex/Vinyl Toys – These toys are not recommended for your aggressive chewer because it is not built for heavy play. Once your dog bites through these toys, there could be a sharp edge in the toy that could harm your dog’s mouth. It could also lead to extreme discomfort and an infection. Plush/Fleece Dog Toys – Plush or fleece toys may be cute but these are not really recommended for heavy chewers. This is because these toys are not indestructible. If you have an aggressive chewer, he will easily tear through the toy and eat the insides. When this happens, it could cause discomfort, digestive issues, or even more serious health issues to your dog. Squeaker Toys – Sure, squeaker toys may be a lot of fun for dogs. But if you have an aggressive chewer, the risks outweigh how much fun you can expect your dog to have. Most squeaker toys are made of material that rough dogs can tear through easily. This is because these dogs will stop at nothing to find whatever it is that’s causing the squeaky noise. As soon as they tear through the toy and find the device, they might eat it. If you wish to give your dog a squeaker toy, you can still do so but make sure to keep a close eye on your dog. One thing to remember about dogs is that there is no one generalization on what breed needs a tough toy. As a matter of fact, aggressive chewers come in various sizes, shapes, and breeds. 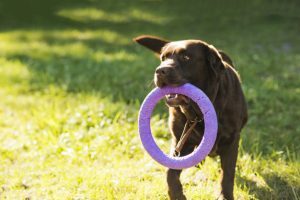 This is why it is always important to know your dog well and know if he is the type who will need a durable and tough dog toy. If you have a dog with any of these breeds, it may be best to pick out a durable and tough toy for them to play with. When you want to buy the best dog chew toys for aggressive chewers, you have to remember that they don’t necessarily come with a cheap price. Truthfully, dog ownership can often be expensive. 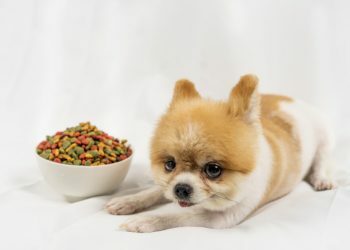 As a pet parent, you need to make sure that you provide only the best for your pet. Although there are some areas where you can skimp on, there are other things that you should spend for. This includes the best dog bones for aggressive chewers and their toys. One of the biggest reasons why you should not buy cheap toys for your power chewer is because it could potentially endanger your dog. 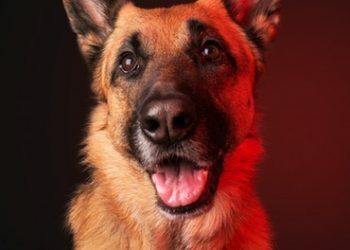 If you buy a cheap toy, it could end up with you bringing your dog to a vet and spending thousands of dollars for his medical or emergency bills. In addition to posing a health hazard for your dog, cheap toys won’t save you money in the long run. If you have an aggressive dog, he could easily tear through the toy and you’ll end up replacing it more quickly. In the process, you tend to spend more money buying a new toy every time. This is why it is best to purchase a durable dog toy for aggressive chewers. There are a lot of dog toy manufacturers that market their product as a durable and tough one. However, only a few are able to stand up to the test. This is why you will need to check out the tested and proven durable dog toys before you purchase one for your aggressive chewer. If you are looking for a durable dog toy that you can play with your dog, the Flossy Chews Cottonblend Color 3-Knot Rope Tug is one option to really love. It is a durable rope toy that lets you spend some time with your dog. A good thing about this dog toy is that it manages to clean your dog’s teeth while he plays with. The rope fibers of the toy help in flossing your dog’s teeth while he tugs and chews on them. The Flossy Chews Cottonblend Color 3-Knot Rope Tug is available in a variety of sizes and colors so you are free to pick out a size and design you want your dog to play with. One of the truly indestructible dog toys available in the market is the Goughnuts Indestructible Chew Toy MAXX 50 Ring. Because of how tough this toy is, you will get to save money on your purchase because you won’t need to replace it ever again. And when it’s time to replace this dog toy, you’ll know it because the red indicator can already be seen. 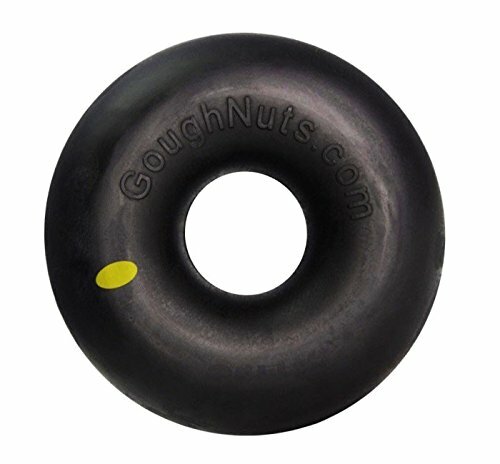 If this visual indicator is already exposed, you can send it back to Goughnuts to get a free replacement. Despite its tough, heavy, and super-durable material, the Goughnuts Indestructible Chew Toy MAXX 50 Ring manages to stay afloat. This is why your dog can play with it anyway he wants to. This dog toy is often pricier compared to other options. But if it’s any consolation, you get what you pay for with this particular toy. When it comes to durable dog toys, the Kong Rubber Flyer is one popular option for pet lovers. This is because this dog toy has been ranked as among the best chew toys for aggressive chewers. You can play with this toy and let your dog fetch it. Some of the reasons why many dog owners love this particular toy is because it is tough and durable. 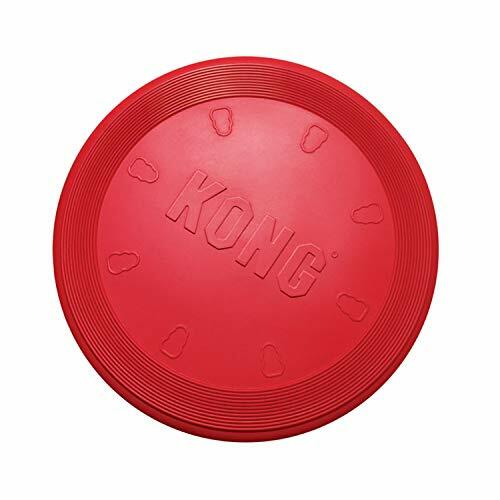 The Kong Rubber Flyer is made of natural rubber that is non-toxic to your dog. This material also makes it softer on your dog’s teeth and gums compared with plastic frisbees. A good thing about this dog toy is that it is available in various sizes, which can fit your dog’s size as well. 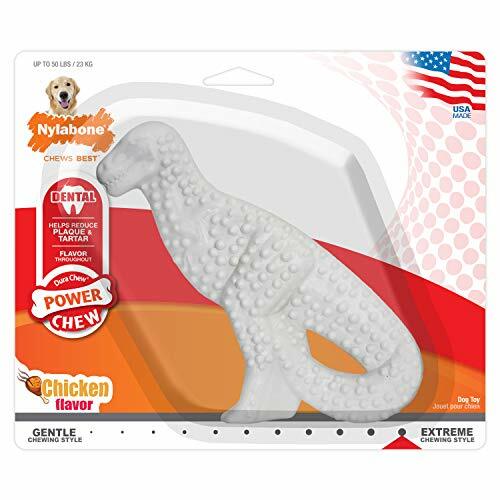 One of the best dog toys that you can buy for an aggressive chewer is the Nylabone Dental Dinosaur Power Chew Durable Dog Toy. This is because this dog toy does not only serve as entertainment for your dog. At the same time, it is a dental chew toy that helps clean your dog’s teeth as he munches through the T-rex. Nylabone has created this particular dog toy for tough chewers that weight up to 50 lbs. 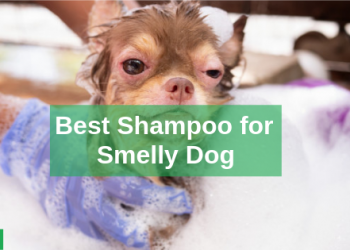 Because of this, it has become a crowd favorite since it helps clean dog’s teeth. The toy comes with rounded nubs and bristles that manage to control plaque and the build-up of tartar. Apart from being available in a T-rex design, the Nylabone Dental Dinosaur Power Chew Durable Dog Toy is also available in other dinosaur models, such as the Stegosaurus and Brontosaurus. You can complete the set and let your dog play with them. 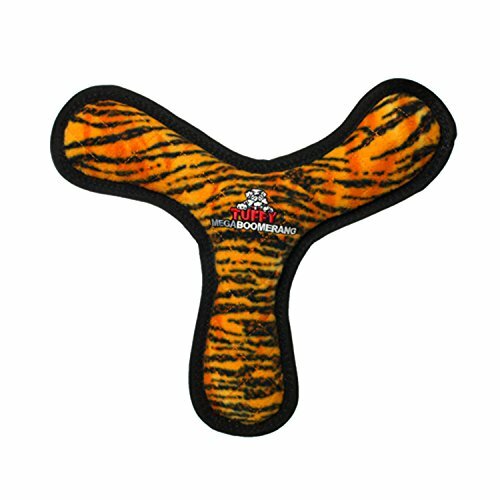 As compared to other dog toys available in the market, the Tuffy Mega Boomerang is an option that is made of fabric. The good thing about this is that the fabric used in this particular dog toy is able to withstand an aggressive dog’s teeth. Despite its fabric material, it is very durable since it has gone through layers of stitching and material. You can also toss it in the machine to clean it. Some of the features of this particular dog toy include its availability in various colors. If you are not fond of the tiger design, you can opt for the chain link or brick pattern. This dog toy also floats and can be used to play tug or as a frisbee fetch toy. If you would like to keep your dog busy, the West Paw Zogoflex Tux Interactive Treat Dispensing Dog Chew Toy for Aggressive Chewers is one dog toy that will keep him entertained for hours. This is because this dog toy can be stuffed with different treats and goodies that your dog can try to get. West Paw has created this dog toy with a hollow space where dog treats can be hidden. As a result, your dog gets to focus his time and energy on dispensing the treats inside of the toy. This will keep him stimulated for hours, especially since it is not so easy to dispense. Apart from hiding dog treats, this particular dog toy can be used for playing fetch. It is also able to float on water, which helps if you want your dog to enjoy swimming as well. 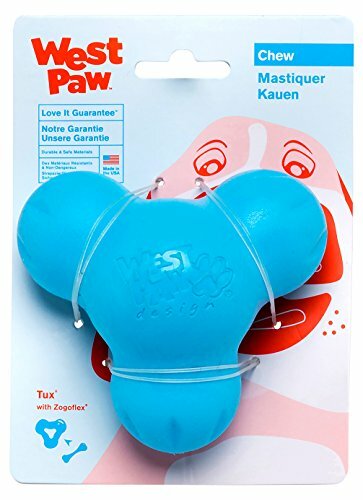 West Paw has created a toy that is easy to clean. It can easily be tossed in the dishwasher to clean the toy thoroughly. With its sturdy material, it is perfect for dogs that love to gnaw. Another dog toy that’s worth checking out is West Paw Zogoflex Hurley Tough Dog Bone. 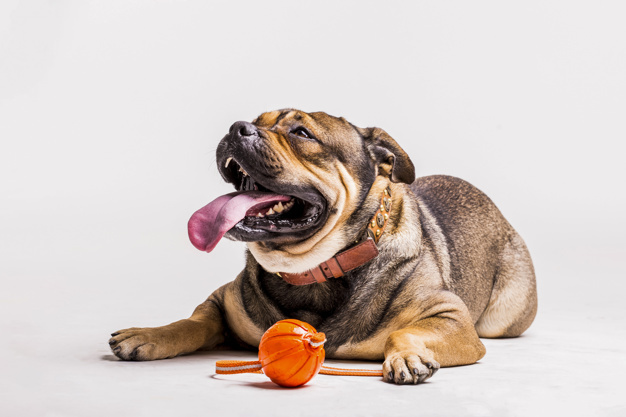 West Paw has created a dog toy that is perfect for aggressive chewers who like to play alone. Because of how durable the material is, West Paw Zogoflex Hurley Tough Dog Bone is one of the best dog bones for aggressive chewers. If it gets damaged or destroyed, West Paw will even send you a new one right away. Just like the previous West Paw dog toy, the West Paw Zogoflex Hurley Tough Dog Bone can float in water. It can also be used to play fetch with your dog. You can also clean it in the dishwasher. Not to mention, the dog toy is non-toxic, BPA and Phthalate-free, and FDA compliant. If you opt for a cheap dog toy, it will break apart right away once an aggressive chewer starts playing with it. In the end, you’ll only have to keep buying a new dog toy to replace the old one that your dog destroyed. Plus, a cheap dog toy can also be dangerous for your dog. When you’re shopping around for a dog toy, see to it that it is able to withstand the tear and pull of your aggressive chewer. This is the best way you can make sure you are providing your dog a durable toy that won’t get destroyed so quickly. 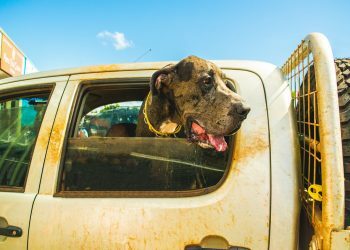 In the process, you can save money with your dog toy purchase.